The latest live-action remake of a classic Disney cartoon brings nothing new to a classic fairytale story in a beautiful, but unoriginal film. Remaking a fairytale that everyone knows and loves is always a difficult task as if you stray too far from the original story you are likely to annoy an audience. This film however has the opposite problem, it sticks too closely to it’s source material that it ends up becoming a boring, stretched out film which does little more than look amazing. Look amazing the film does and this covers up much of the boredom of the plot as your brain is free to enjoy the sumptuous sets and amazing costumes. The costumes are particularly great as they draw the eye and sum up each character through the use of colour and patterns. The most talked about dress will always be the crystal covered blue ball-gown that Cinderella wears in the ballroom scene, however for me it is the yellow and black dress worn by Cate Blanchette’s evil Stepmother that is the most elegant. The best scene and character of the film by far comes from the cameo-length performance by Helena Bonham Carter as the Fairy Godmother. She brings some much needed comedy to the film which is lacking charm and brings it in spades in a truly hilarious and fast-paced transformation sequence. This single scene is so good that I would even say it’s worth watching the entire movie just for it, it lifts the film from average to something just above average. Cinderella is a film which whilst offering nothing new is worth watching for its high quality design and the performance of Helena Bonham Carter. So after a brief hiatus following my David Lynch challenge I’ve begun my next challenge, which is to watch ever Woody Allen film in reverse order (just for a change). As Woody does not always act, write and direct his films I’ve decided to go for films in which he is credited in two of three roles to give me a wider range of films to watch whilst making sure that each film is a Woody Allen picture. 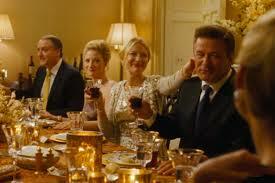 The first week’s film was the recently released Blue Jasmine. 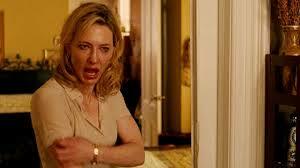 Blue Jasmine follows Jasmine (Cate Blanchett) a lady who married rich and enjoyed a life of money and no work. When she loses everything she begins to suffer from depression and mental illness and is forced to move in with her adoptive sister (Sally Hawkins) on the poor side of San Francisco; something which both girls struggle to adapt to. The film is a delight to watch as it portrays the story in a unique and interesting way. It is cleverly written in that very little back story is explained yet it is instantly obvious what has happened. It is a strange balance of being completely unpredictable yet also predictable at the same time; which is something rare in a modern film. The actors in the film are all cast perfectly and portray their characters exactly as you can imagine them being written; the stand out being Cate Blanchetts descent into craziness and Alec Baldwin (essentially playing an exaggerated persona of himself). There are many comic moments in the film that balance out the drama and it is amazing how in one scene Allen can shift the perception of a character in one scene; turning a nice character into an evil one and back within just a few minutes of screen times. Watching the film and thinking of it now, I honestly struggle to name an aspect which I didn’t enjoy… it was well paced, scripted and performed with the only negative point I could come up with being that at times it was unclear whether certain scenes where dark comedy or pure drama. Watching the film in a cinema there where several scenes that got members of the audience (myself included) laughing; whilst other people (the friend I was with) acted much more seriously. Discussion after the film led me to believe that it was written purposefully in each way and cannot be defined as a bad point. As a new feature I’ve decided to create a little scale to register the quality of the film based on Allen trademarks. 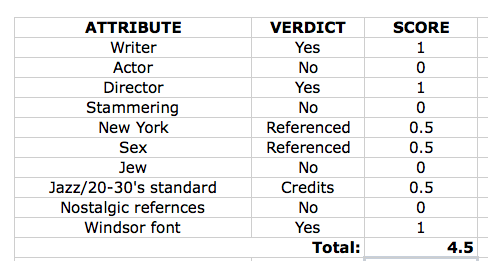 The table below shows 10 characteristics typically seen in one of his films and a score is made for each. This total will be halved and added to my personal score to give each film a score out of 10. 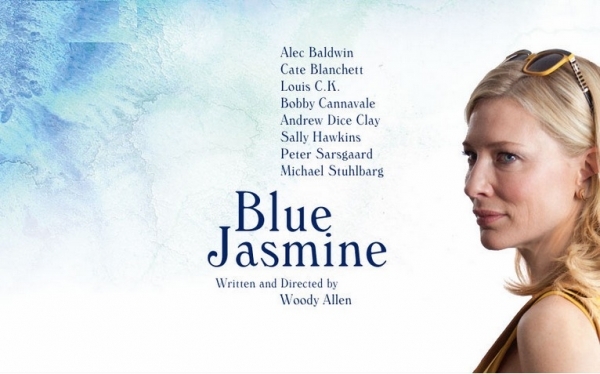 Many people dub this film Woody Allen’s best in years and whilst I do not fully agree (being a huge fan of Midnight in Paris); it is an astounding piece of cinema which must be given five Woodys. 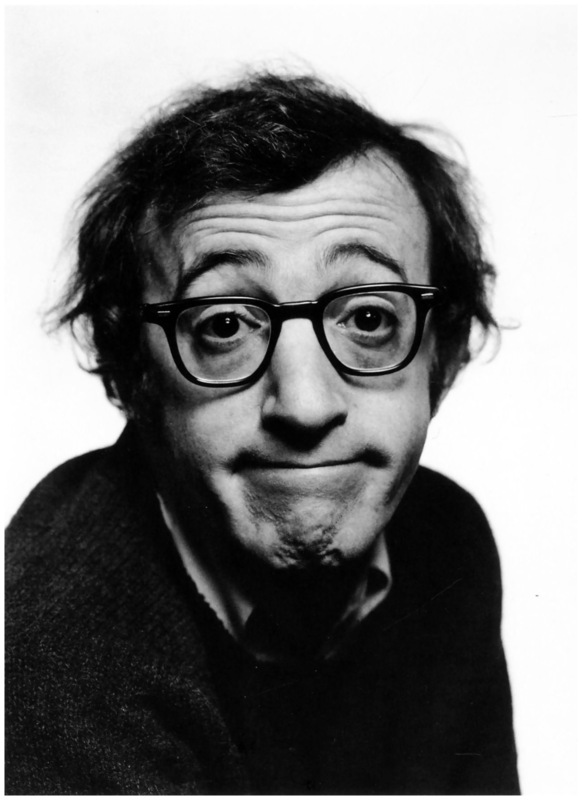 Which when added to the Allen score of 2.25 (rounded down to 2) gives the film a score of 7 Woody’s.